MRI and CT scanning are fast becoming the norm in human medical facilities often as the preferred imaging technique, used in preference in many cases to conventional X-rays. People are also becoming familiar with the availability and concepts of these systems either through personal experience or via the media and the demand for their use is increasing. A CT (computerised tomography) scanner is a special kind of X-ray machine. Instead of sending out a single X-ray through your body as with ordinary X-rays producing a flat image, several beams are sent simultaneously from different angles. The resulting images can be reconstructed using special computer software allowing a 360° view of the part of the body that has been scanned producing 2-dimentional or 3-dimensional images. These images are then used to help us achieve a diagnosis. Much more information is obtained from a CT scan than can be obtained from normal X-rays. The MRI scan uses magnetic and radio waves to create an image. Radio waves 10,000 to 30,000 times stronger than the magnetic field of the earth are sent through the body. These affect the body’s atoms, forcing the central part, the nucleus, into a different position. As they move back into place they send out radio waves which are picked up by the scanner and turned into a picture by a computer. Is CT and MRI dangerous? There are no known side effects or dangers connected with CT or MRI. The scan is not painful and animals cannot feel the scan. As we have to sedate or anaesthetise animals to perform the scan there are certain risks associated with this but your vet will perform a full examination of your pet prior to minimise these risks. Our in house 16 slice Siemens CT unit is now fully available and scans are performed on a daily basis. You can refer cases to our orthopaedic service as normal and we will discuss diagnosis and treatment options directly with the owner. In order to increase the availability MRI to clinicians, Beechwood have partnered with Burgess Diagnostics and can also offer an MRI service to your patients. 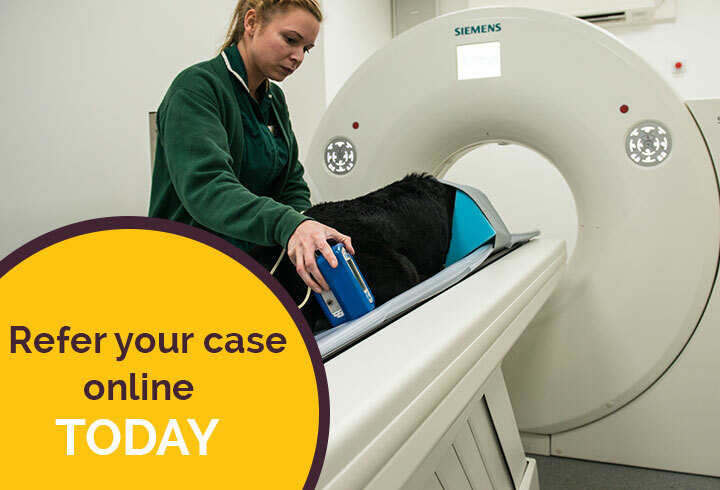 If you have a case you feel will benefit from advanced imaging and wish to discuss prior to referral please email details of the case to mark.straw@beechwoodvet.co.uk or telephone 01302 534999. Alternatively fill in the online referral form.